On the boat we were mostly virgins. We gave birth at five in the morning in the pressing room at the Eagle Hand Laundry and that night our husband began kissing us in bed. I said to him, "Can't you wait?" 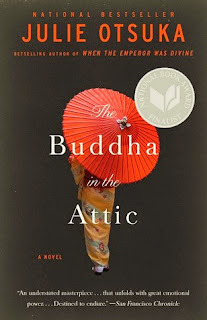 Synopsis of The Buddha in the Attic by Julie Otsuka: Julie Otsuka’s long-awaited follow-up to When the Emperor Was Divine is a tour de force of economy and precision, a novel that tells the story of a group of young women brought from Japan to San Francisco as “picture brides” nearly a century ago. In eight incantatory sections, The Buddha in the Attic traces the picture brides’ extraordinary lives, from their arduous journey by boat, where they exchange photographs of their husbands, imagining uncertain futures in an unknown land; to their arrival in San Francisco and their tremulous first nights as new wives; to their backbreaking work picking fruit in the fields and scrubbing the floors of white women; to their struggles to master a new language and a new culture; to their experiences in childbirth, and then as mothers, raising children who will ultimately reject their heritage and their history; to the deracinating arrival of war. This sounds like a wonderful book. I'm definitely adding it to my TBR list. My Friday post features BEAUTIFUL RUINS. I have to confess, I liked it at first glance for its cover. What an interesting beginning! I have to say I've never see an opening line like that! Short and to the point. The whole 1st paragraph is about virgins. This book sounds absolutely amazing! You always have such great books for these memes which leads to me constantly adding to my TBR pile. I have heard about this author and her first book but I'd never actually read anything from the book so reading these two excerpts was really good! Thanks for sharing :) Hope you have a great weekend! I picked this up at a used book sale. If I like this, I'll definitely look for When the Emperor Was Divine. Let me know if you end up reading any of her books, Juli! I'm shaking my head! men....LOL The cover and title have me curious too. I think I'd enjoy this. Virgins in a boat and that husband definitely needs a slap in the face! LOL! I've been wanting to get to this book for a long time. It sounds like such an interesting way of telling a story! I'd never heard of Julie Otsuka before this book DoingDewey -- have you read her other book?